On Sunday morning we made a visit to the Maidenhead & District CC “Ski-Slope” 25 (on the H2). 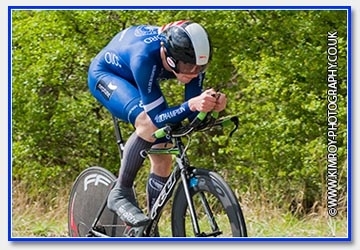 Matt Kerin made the decision on the drive over that (due to ill health) he would start his taper for Varsity 2018 early and provide team support for Ollie Bent who was riding his first solo TT since the aforementioned race in this year’s edition. With a lot of motivation needed from Matt (having already outperformed himself in Cambridge on Saturday) along with providing some chemical stimulation…. Ollie a bit distracted by Matt’s cheerleading, missed out on a turbo warm-up and ended up riding a bit hard to the line, making his 30 second call nice and warm. The start was fast on the “ski-slope” hitting 75.2 kmph, while trying to stay tucked and keep the pedals turning on nice smooth-straight dual carriageway. Next came a strong sector of dual-carriageway and Ollie soon caught his 3 minute man. The mid section of the course proved much tougher. Having to coming to a dead stop at the roundabout from the dual carriageway the legs started to burn a bit after turning too bit a gear back up to speed. Lack of time recently spent back on the TT bike became apparent, as he struggled to hit a strong rhythm on the rougher more rolling road surface of the mid sector and made the turn at a demoralising 30 minutes. The return lap was marred with a missed turn on the roundabout but after that had been dealt with, a return to smooth dual carriageway gave a reminder to the promising fast start to the race. This new speed encouraged a last effort to the line and allowed Ollie to close out a new PB by almost 1 minute.